Before :- Bela M. Trivedi, J.
S.B. Civil First Appeal No. 55 of 1984. D/d. 23.07.2013. For the Appellants :- G.K. Garg, Sr. Advocate with Vijay Singh Jangid, Advocates. For the Respondent Nos. 1 and 2 :- Sudhanshu Kasliwal, Sr. Advocate with R.N. Vijay, Advocates. For the Respondent No. 4 :- Jitendra Mitruka, Advocate. Anar Devi v. Parmeshwari Devi, AIR 2006 SC 3332. Baljinder Singh v. Rattan Singh, (2008) 16 SCC 785. Balmukund v. Kamla Wati, AIR 1964 SC 1385. Budh Ram v. Bansi, (2010) 11 SCC, 476. Commissioner of Wealth Tax, Kanpur v. Chander Sen, (1986) 3 SCC 567. Gopal Singh v. State of Rajasthan, 1983 RLW, 475. Gurupad Khandappa Magdum v. Hirabai Khandappa Magdum, AIR 1978 SC 1239. Man Singh v. Ramkala, (2010) 14, SCC 350. Nagappan v. Ammasai Gounder, (2004)13 SCC 480. Nagesh Bisto v. Khando Tirmal, AIR 1982 SC 887. Nagubai Ammal v. B. Shamarao, AIR 1956 SC 593. Prasad v. V. Govindaswami Mudaliar, (1982) 1 SCC, 185. R. Kuppayee v. Raja Gounder, (2004) 1 SCC 295. Rani v. Santa Bala Debnath, (1970) 3 SCC, 722. Ravindra Kumar v. State of Assam, AIR 1999 SC 3571. Shiba Prasad Singh v. Rani Prayag Kumari Debi, 59 Ind application 331 : (AIR 1932 PC 216). Sital Prasad Singh v. Ajablal Mander, ILR 18 Pat 306 : (AIR 1939 Pat 370). Narayan Bal v. Sridhar Sutar, (1996) 8 SCC 54. State of U.P. v. Rajkumar Rukmini, AIR 1971 SC 1687. Sunil Kumar v. Ram Prakash, AIR 1988 SC 576. T. Venkata Subbamma v. T. Rathamma, AIR 1987 SC 1775. Thakur Gopal Singh v. CWT, Rajasthan, 1973 WLN 14. Thimmaiah v. Ningamma, (2000) 7 SCC 409. Valliammai Achi v. Nagappa Chettiar, AIR 1967 SC 1153. (hereinafter referred to as 'the trial court')in Civil Suit No. (45/71) 98/74, whereby the trial court has dismissed the suit of the appellants-plaintiffs, seeking partition, possession, declaration and injunction in respect of the suit-properties. 2. The facts in nutshell giving rise to the present appeal are that the present respondent No.7 (original defendant No.7) happens to be the father of appellant Nos. 1 to 4 and the husband of the appellant No.5. The appellants-plaintiffs Nos. 1 to 4, being minors, at the relevant time, through their mother, the appellant No.5 (defendant No.5), and the appellant No.5 in her personal capacity had filed the suit being No. (45/71) 98/74, seeking partition of the properties described in para 1 and 3 of the plaint and seeking recovery of actual possession of their ⅚th share in the said properties. The appellants-plaintiffs had also sought declaration to the effect that the sales of the ancestral suit properties made by the defendant No.7 as mentioned in para Nos. 4-ka to 4-da were without any legal necessity of the family and, therefore were null and void and that the said sales be declared as cancelled. They had also sought permanent injunction against the defendant Nos. 7 for restraining him from transferring or creating any charge over the said ancestral suit properties. 3. It was alleged by the appellants-plaintiffs in the plaint interalia that there was a Haveli known as 'Padli House' as described in para No. 1, which was allotted to their ancestor late Shri Thakur Mansinghji Padli, by way of State Grant in the samvat year 1872, by the then Maharaja Saheb of the State of Jaipur. The said Haveli was repaired and renovated from time to time by the ancestors of the plaintiffs Nos. 1 to 4 from the income of the Thikana Padli. The said entire Haveli and the Haveli at Gram Padli were the joint family properties of the plaintiff Nos. 1 to 4 and defendant No.7 and they all were residing in the said Haveli at Jaipur. It was further alleged that the defendant No.7 without any legal necessity of the family or without any lawful purpose was bent upon transferring different parts of the said Haveli to different persons by creating charge over the said property; that the defendant No.7 had the bad habits of drinking and gambling, for which he had borrowed some small amount from the defendant Nos. 1 to 6 and had executed sale deeds and mortgage deeds falsely stating therein about the receipt of entire amount. According to the appellants-plaintiffs, the defendant No. 7 had executed different sale-deeds in favour of the defendant Nos. 1 to 6 in respect of the garages and the shops situated within the precincts of the said Haveli, as mentioned in para 4-ka to 4-da. Since the said properties were the ancestral properties, each of the plaintiffs and the defendant No.7 had undivided ⅙th share in the same, and hence the said alienations made in favour of the other defendants by the defendant No.7 were not binding to the plaintiffs, and the same were required declared as cancelled. The suit therefore for partition, declaration and injunction as prayed for was filed. 4. The said suit was resisted by the respondent Nos. 1 and 2 (defendant Nos. 1 and 2) by filing separate written statements, but raising the same contentions, denying the allegations made in the plaint and further contending interalia that late Shri Thakur Jaswant Singhji, father of the defendant No.7 was the last holder and occupier of the subject Haveli. The said Haveli was gifted by the said Jaswant Singhji to his son Shardul Singhji the defendant No.7, by executing a gift deed on 13.9.60, and since then the said Haveli was owned and occupied by the defendant No.7 as his self acquired property. It was further contended that the plaintiffs were staying with the defendant No.7 in the part of the said Haveli, however, the said Haveli was neither ancestral, nor the Joint Hindu Family property. It was also contended that the sale-deeds were executed by the defendant No.7 for discharging the antecedent debts and for the legal necessity as mentioned in the sale-deeds, and even otherwise the suit properties being the self acquired properties of the defendant No.7, he was entitled to sell the same. It was also contended that the suit was bad for nonjoinder of necessary parties as the plaintiffs had not impleaded the mother and sister of the defendant No.7, who would be also co-parceners, if the suit properties were treated as the ancestral properties. The respondent No.3 to 5 (defendant Nos.3 to 5) also had filed their respective written statements contending interalia that the sale-deeds executed in their favour by the respondent No.7 (defendant No.7) were executed for discharging the antecedent debts and for legal necessity of the family of the defendant No.7. It appears that the respondent Nos. 6 and 7 (defendant Nos. 6 and 7) did not contest the suit nor did they file any written statement. "1. Whether the property sought to be partitioned is ancestral? 2. Whether the plaintiffs share is ⅙ individually? If so, whether they are entitled to be put in exclusive possession of that share, if the suit is decreed for partition? 3. Whether the sales effected by defendant No.7 were for legal necessity and plaintiffs are bound by them? 4. Whether the suit property is impartible for rule of primogeniture being applicable to the suit property? 5. Whether the suit is not maintainable in absence of relief for dispossession of defendants No. 1 to 6 and for cancellation of alleged sales deed etc.? 6. Whether the suit is bad for misjoinder of party for the reason of plaintiff No.5 being not entitled to claim partition? 7. Whether the suit suffers from nonjoinder of necessary parties in the absence of plaintiff's grand mother and father's sister not impleaded as parties to the suit? 8. Whether the plaintiffs are entitled to partition? If so, in what manner? 9. Whether the court fee is deficient? 10. Whether a gift was made in the year 1960 by Shri Jaswant Singh in favour of Shardul Singh? If so, its effect on the suit? 6. Both the sides had led their respective oral as well as documentary evidence. The trial court after considering the evidence on record dismissed the suit of the appellants-plaintiffs, however decided certain issues in favour of the plaintiffs and certain issues against them. The trial court while deciding the issue Nos. 1 and 4 interalia held that the properties sought to be partitioned were ancestral properties and being impartible, the rule of primogeniture was applicable. The trial court while deciding issue No.3 held that the sale deeds executed by the defendant No.7 were for legal necessity and therefore, the same were binding to the plaintiffs also. While deciding issue No.5, the trial court held that the suit was filed for partition and declaration only, and that no prayer was sought seeking possession of the suit properties, which were in possession of the respective defendants. So far as issue Nos. 2 and 8 were concerned, the trial court held that the plaintiffs were not entitled to the partition of the suit properties, and did not decide the issue as to whether each of the plaintiffs had ⅙th share in the suit properties or not, as claimed by them. The issue No.9 was decided in favour of the plaintiffs as regards the payment of court fees. Issue No. 10 was not decided in view of the findings recorded in the issue Nos. 1,3 and 4. It appears that the trial court did not decide the issue Nos. 6 and 7 as the same were already decided earlier vide the order dated 5.9.75, wherein it was held that the suit was not bad for misjoinder of parties or for nonjoinder of necessary parties. 7. It appears that during the pendency of the present appeal, the respondent No.3-Shivnarain had expired on 26.5.84. Since the application for bringing on record his legal representatives was not pressed for by the learned counsel for the appellants, the appeal had stood abated qua the respondent No.3, as per the order dated 24.1.94. It also appears that the respondent Nos. 2 and 5 had also expired during the pendency of the appeal, however their respective legal representatives have been brought on record by the appellants. During the course of arguments the learned senior counsel Mr. Kasliwal for the respondent Nos. 1 and 2 had submitted an application for taking on record certain documents under Order 41, Rule 27 CPC which was allowed by the court as per the order dated 2.5.13, and accordingly the documents have been taken on record. 8. The learned counsels appearing for the parties have made elaborate submissions on factual and legal aspects of the appeal and relied upon plethora of judgments in support of their respective submissions. 9. 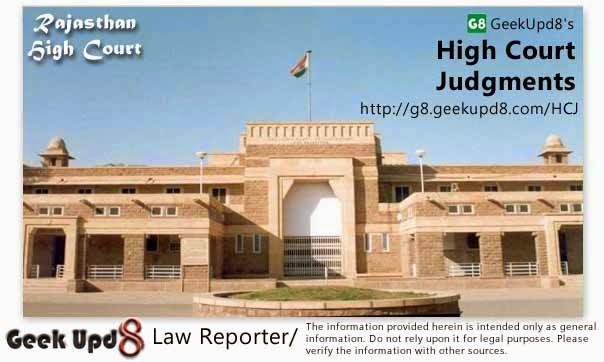 The learned senior counsel Mr. G.K. Garg for the appellants taking the court to the evidence on record as well as to the findings recorded by the trial court in the impugned judgment, vehemently submitted that the trial court had misread the pleadings while deciding the issue No.5 by holding that the suit was not maintainable as the plaintiffs had not prayed for the relief of possession or for cancellation of the alleged sale-deeds etc, though the appellants-plaintiffs had specifically sought the relief of possession of their ⅚th share collectively in the suit properties and also sought declaration with regard to the alleged sale-deeds in question being null and void. He has submitted that the order dated 5.9.75 passed by the trial court on issue Nos. 6 and 7 regarding nonjoinder and misjoinder of parties had attained finality, and rightly not dealt with in the final judgment. He further submitted that the findings recorded by the trial court while deciding the issue No.10 that the suit properties were ancestral and therefore, the registered gift deed executed by late Shri Jaswant Singh in favour of the respondent No.7 did not assume any significance, have also remained unchallenged at the instance of the respondents, as the respondents have not filed any cross objection against the said findings. 10. Challenging the findings recorded by the trial court on issue Nos. 1,2 and 8, the learned counsel Mr. Garg has submitted that the trial court had committed a gross error in not holding that each of the appellants-plaintiffs had ⅙th share in the suit properties, more particularly, when it recorded the finding that the suit properties were ancestral properties and not the self acquired properties of late Shri Jaswant Singh. According to Mr. Garg the trial court ought to have declared the sales made the respondent No.7 as null and void as the said sales were effected by the respondent No. 7 in respect of the ancestral properties neither for any legal necessity nor for discharging the antecedent debts. Mr. Garg had also taken the court to the various judgments of the Apex Court and our High Court in the light of various provisions contained in the Land Reforms and Resumption of Jagir Act, 1952, Jaipur Matami Rules, 1945, Jaipur State Grants Land Tenures Act, 1947 and Hindu Succession Act, 1956, (hereinafter referred to as 'the Act of 1956') to submit that even if it was presumed that the suit properties were Jagirs and Shri Jaswant Singh was last holder of the suit properties by rule of primogeniture, then also on the resumption of Jagirs, such impartible character of the properties was lost and the same were required to be treated as the coparcenary properties. According to Mr. Garg, the said properties being co-parcenary properties, the appellants were entitled to their respective shares in the same as per the provisions contained in the Hindu Succession Act, 1956 (hereinafter referred to as 'the Act of 1956'). He further submitted that late Shri Jaswant Singh, had no authority to execute the gift deed in favour of the respondent No.7 alone when the appellants also had undivided interest in the suit properties and that the alleged gift deed dated 13.9.60 being null and void ab initio. The sale deeds in question executed by the respondent No.7 on the basis of such gift deed were also null and void and not binding to the appellants. The learned counsel has relied upon number of decisions of the Apex Court and various High Courts in support of his submissions, which shall be dealt with hereinafter as and when necessary. 11. Per contra, the learned senior counsel Mr. S. Kasliwal for the respondent Nos. 1 and 2 has vehemently submitted that the suit was filed by the appellants-plaintiffs in collusion with the respondent No.7 misusing the process of law. According to him, even though certain issues were decided by the trial court against the respondents, against which no cross objections are filed by the respondents, the appellate court has ample powers under Order 41, Rule 33 of CPC, to pass appropriate order and decree as the case may require. Placing heavy reliance on the copy of the gift deed dated 13.9.60 (Ex.A/1), Mr. Kasliwal submitted that the said gift deed executed by late Shri Thakur Jaswant Singh in favour of his son Shardul Singh i.e. the respondent No.7, was not only not challenged by the appellants in the suit, but the said gift deed was also acted upon by the respondent No.7 with the knowledge of the appellants. Relying upon the documents produced alongwith the application filed by the respondents under Order 41, Rule 27 , Mr. Kasliwal submitted that during the pendency of this appeal, the respondent No.7 had sold out the property adjoining to the subject properties, by executing sale deed in favour of some third party, and the appellant Nos 1 to 4 had put their respective signature as witnesses therein. He has further submitted that late Shri Thakur Jaswant Singh keeping in view the legal position as it stood prior to coming into force of the Act of 1956, had made necessary arrangements for the maintenance of his wife and daughter in the said gift deed dated 13.9.60 and therefore, his wife and daughter had also never objected to the said gift deed made in favour of Shardul Singh. 12. He further submitted that since Thakur Jaswant Singh died in the year 1966, leaving behind the female members specified in Class I of the Schedule, Section 6 of the Act of 1956 will not be applicable, but Section 8 thereof will be applicable, and in that case the appellants had no right to seek partition of the suit properties. Mr. Kasliwal also referred to and relied upon the evidence adduced by the appellants to submit that the subject properties which were part of the property known as "Padli House", were not the "Jagirs" and that Jaswant Singh had inherited the said properties by Rule of primogeniture and he alone was the owner of the said properties. According to him, by virtue of the gift deed dated 13.6.90, the respondent No.7 Shardul Singh had become the absolute owner of the suit properties and was entitled to execute the sale deeds in question. Mr. Kasliwal submitted in the alternative that even if the subject properties were treated as the ancestral properties, then also since the properties were sold out by the respondent No. 7 Shardul Singh in favour of the other respondents to pay the antecedent debts and for legal necessity of the family, as mentioned in the different sale-deeds, and hence the said sale-deeds were binding on the appellants also. 13. Re-agitating the findings recorded on issue Nos. 6 and 7, Mr. Kasliwal has submitted that the suit was bad for misjoinder of parties as the appellant No.5 had no right to seek partition,, and that the suit was bad for nonjoinder of necessary parties as the wife and daughter of late Shri Jaswant Singh were not joined as party-defendants in the suit. As regards the findings on issue No.10 recorded by the trial court, Mr. Kasliwal has submitted that even if it is assumed that the subject properties were coparcenary properties, then also in view of Section 8(3) of the Hindu Minority and Guardianship Act, 1956, any disposal of any immovable property by natural guardian in contravention of sub-section 1 or sub-section 2 would be voidable at the instance of the minors. In short, the learned counsel has supported the final decree passed by the trial court and urged to dismiss the appeal. The learned counsel has also placed reliance upon the plethora of decisions to buttress his submissions, which shall be dealt with hereinafter as and when necessary to do so. 14. The learned counsel Mr. Jitendra Mitruka for the respondent No.4 has also supported the submissions made by the learned counsel Mr. Kasliwal for the respondent Nos. 1 and 2 and submitted that the defendant No.7 Shardul Singh had become the absolute and sole owner of the suit properties by virtue of the gift deed dated 13.9.60 and that all the sales effects by him were legal and valid. 15. From the submissions made by the learned counsels for the parties and perusing the evidence on record, following points arise for determination before this court. (a) Whether the concerned respondents could attack in the present appeal, the adverse findings recorded by the trial court against them on certain issues, without filing the cross-objections? (b) Whether the suit proceedings were collusive proceedings between the appellants-plaintiffs and respondent No.7-the defendant No.7? (c) Whether the suit properties were the ancestral properties or the personal properties of late Shri Jaswant Singh? (d)Whether late Shri Jaswant Singh was entitled to execute the gift deed dated 13.9.60 bequeathing the properties to his son Shri Shardul Singh? (e) Whether sales of the suit properties made by respondent No.7 in favour of the other respondents were for legal necessity or for discharge of the antecedent debts? (f) Whether the appellants are entitled to the reliefs of partition, declaration and injunction as prayed for in the suit? 16. At the outset, it is required to be stated that the suit properties in respect of which the reliefs have been sought by the appellants-plaintiffs are the properties described in para 1,3 and 4 of the plaint, i.e. the Haveli situated at Khajanewalon Ka Rasta, Chowkri Topkhana Desh, Jaipur City, known as "Padli House" as described in para 1, and one Haveli situated at Gram Padli as described in para 3, and the garages and the shops in the said Haveli known as "Padli House" as described in para 4 of the plaint. The respondent No.1 (defendant No.1) was sold the property described in para 4-Ka, the respondent No.2 (the defendant No.2) was sold the property described in para 4-Kha, the respondent No.3 (the defendant No.3) was sold the property described in para 4-Ga, the respondent Nos. 4 and 5 (defendant Nos. 4 and 5) were sold the property described in para 4-Gha and the respondent No.6 (defendant No.6) was sold the property described in para 4-Da of the plaint. It is pertinent to note that the respondent Nos. 1 to 5 though had contested the suit by filing their respective written statements, the respondent Nos. 4 and 5 had not led any oral or documentary evidence in the suit. The respondent Nos. 6 and 7-defendant Nos. 6 and 7, did not contest either the suit or the present appeal. The respondent No. 3 expired during the pendency of appeal, and the appeal was held to be abated against the said respondent No.3 Shivnarain as per the order dated 24.1.94 passed by this court. Under the circumstances the real contestants in the present appeal appear to be the respondent No.1 and 2 (defendant No.1 and 2). 17. Though it was sought to be submitted by the learned senior counsel Mr. Kasliwal for the respondent Nos. 1 and 2 that the entire appeal should have been treated as abated on the death of the respondent No.3 in view of Order 22, Rule 4 of CPC, the court does not find any substance in the same. It is well settled legal position that where each one of the parties has an independent and distinct right of his own, not dependent upon one or the other, nor the parties have conflicting interest interse, the appeal would abate only qua the deceased respondent. A beneficial reference in this regard be made of the decision of the Apex Court in the case of Budh Ram & Ors. v. Bansi & Ors. (2010) 11 SCC, 476. In the instant case, each of the respondents had independent and distinct interest, not dependent upon each other, and hence the appeal had stood abated only qua the deceased respondent No. 3 as per the order passed by the court in this appeal on 24.1.94. The said order not having been challenged by the other respondents, the same had attained finality. 18. As stated hereinabove, the trial court had refrained itself from dealing with the issue Nos. 6 and 7 pertaining to nonjoinder and misjoinder of parties, on the ground that the said issues were already decided by the court as per the order dated 5.9.75. According to Mr. Kasliwal for the concerned respondents, the suit was bad for misjoinder of parties, as the plaintiff No.5 Smt. Pushpa Kumari did not have any right to claim partition of the suit properties and, therefore, could not have filed the suit in her personal capacity, and that the suit was bad for nonjoinder of necessary parties as in the suit for partition of the alleged ancestral suit properties, the sister and mother of the respondent No. 7 (defendant No.7) were necessary parties. Mr. Kasliwal has relied upon the decision of the Apex Court in case of Man Singh v. Ramkala, (2010) 14, SCC 350 to buttress his submission. In this regard it is significant to note that apart from the fact that the appellant No.5-plaintiff No.5 had filed the suit in her personal capacity as well as in the capacity of natural guardian of the plaintiff Nos. 1 to 4, who were the minors at the relevant time, the trial court in the order dated 5.9.75 had categorically held that the suit could not be regarded as bad on account of joining of plaintiff No.5 in the suit. Even otherwise, the suit would not be defeated by misjoinder of parties, in view of Order I, Rule 10 of CPC. As regards the nonjoinder of the sister and the mother of the defendant No.7, the trial court had held in the said order that the sister of defendant No.7 had already expired as admitted by the defendant Nos. 1 and 2 and, therefore, the question of impleading her in the suit did not arise, and that there was also nothing on record to show that the mother of the defendant No.7 was alive when the suit was filed. The trial court, therefore, had decided the issue Nos. 6 and 7 against the defendant Nos. 1 and 2. The said order dated 5.9.75 also having remained unchallenged, till the final decision of the suit, the trial court had rightly not dealt with the same in the final judgment. In the instant appeal also, Mr. Kasliwal has failed to point out as to how the suit was bad for misjoinder or nonjoinder of necessary parties. 19. The learned counsel Mr. G.K. Garg for the appellants drawing the attention of the court to the findings on the issue No. 1 and 10 had sought to submit that though the said issues were decided against the respondents and in favour of the appellants, the concerned respondents had not filed any cross-objection challenging the same and, therefore, it was not open for the respondents to challenge the same in the appeal filed by the appellants. In the opinion of the court, the legal position as regards the provisions contained in Order 41, Rule 22 read with Rule 33 of CPC is well settled by the Apex Court in case of Ravindra Kumar v. State of Assam AIR 1999 SC 3571, wherein it has been held interalia that the respondents in appeal can, without filing cross objection, attack the adverse findings upon which a decree in part has been passed against the respondents and that filing of cross-objection after the 1976 Amendment is purely optional and not mandatory. In that view of the matter, the court does not find much substance in the submission made by the learned counsel Mr. Garg that the respondents having not filed the cross-objection against the adverse findings recorded by the trial court, they cannot challenge the same orally in the appeal filed by the appellants. Even otherwise, as per Rule 33 Order 41 of CPC, the appellate court has ample powers to pass any decree and make any order which ought to have been passed or made, and to pass and make such further and other decree or order as the case may require, notwithstanding that the appeal is as to part only of the decree and such powers could be exercised in favour of all or any of the respondents or parties, although such respondents or parties may not have filed any appeal or objection. "15.Now, there is a fundamental distinction between a proceeding which is collusive and one which is fraudulent. "Collusion in judicial proceedings is a secret arrangement between two persons that the one should institute a suit against the other in order to obtain the decision of a judicial tribunal for some sinister purpose". In such a proceeding, the claim put forward is fictitious, the contest over it is unreal, and the decree passed therein is a mere mask having the similitude of a judicial determination and worn by the parties with the object of confounding third parties. But when a proceeding is alleged to be fraudulent, -what is meant is that the claim made therein is untrue, but that the claimant has managed to obtain the verdict of the court in his favour and against his opponent by practicing fraud on the court. Such a proceeding is started with a view to injure the opponent, and there can be no question of its having been initiated as the result of an understanding between the parties. While in collusive proceedings the combat is a mere sham, in a fraudulent suit it is real and earnest." 21. Mr. Kasliwal has failed to show that there was any secret arrangement between the plaintiffs and the defendant No.7 or that the claim of the plaintiffs was fictitious or unreal. The suit proceedings could not be termed as collusive proceedings, merely because the plaintiffs and the defendant No. 7 were closely related and were staying together on the date of the suit till this date. 22. The moot question which falls for consideration before the court is - whether the subject property known as "Padli House", comprising of the Haveli and the shops and the garages situated within the precincts of the said Haveli, were the ancestral properties or the personal/independent properties of late Shri Jaswant Singh, father of the respondent No.7, and after his death, of the respondent No.7 alone. As per the case of the appellants, the property known as "Padli House" was allotted by way of 'Bakhshish' i.e. State Grant by the erstwhile State of Jaipur to their ancestor late Shri Man Singh Raghunath Singh, as per the document of samvat year 1872, produced at Ex.1. According to them, out of the income of the said estate, their ancestors had made repairs and renovations from time to time in the said property and the possession and enjoyment of the said property had continued successively for seven generations upto their grandfather, Thakur Jaswant Singhji. The respondent Nos. 1 and 2, while not disputing that the said estate known as "Padli House" was allotted to late Shri Mansingh in the samvat year 1872 as per the document Ex.1, had raised the contention that as per the rule of primogeniture and as per the law and custom of the erstwhile State of Jaipur, the said property was lastly held by late Shri Jaswant Singh as his independent and personal property. It has also been contended that the said property having been bequeathed by the said late Shri Jaswant Singh to his son Shardul Singh (respondent No.7) by executing the gift deed on 13.9.60 (Ex.A/1), the respondent No.7 Shardul Singh had become the absolute owner of the said property. 23. In order to decide as to whether the subject property was an ancestral property or not, it would be appropriate to broadly appreciate the evidence on record in the light of the law and custom prevailing at the relevant time. The appellant No.5 Smt. Pushpa Kumari, mother of the appellant Nos. 1 to 4 and wife of the respondent No.7 had stated in her evidence before the trial court interalia that the subject property was liable to be partitioned as the same was an ancestral property. She had categorically stated that the said property was not the "Jagir" property in the hands of late Shri Jaswant Singh, but was the ancestral property inherited by him from their ancestor Thakur Mansingh, who was allotted the same by the State as per the document Ex.1. She had also stated that she had three sons when Shri Jaswant Singh was alive and that she was not aware about any gift deed having been executed by the said Shri Jaswant Singh in favour of Thakur Shardul Singh in the year 1960. According to her on the resumption of 'Jagir' lands, her father-in-law Jaswant Singh had received the compensation in the year 1954. She had categorically denied that income from Jagir lands had stopped on the resumption of Jagirs and therefore, the mortgage deeds and sale deeds were executed by her husband Shardul Singh. She had also stated that there was no legal necessity nor any antecedent debt to be discharged nor any immovable property was purchased during the year 1969-70. As regards the relationship between the parties, she had stated that Shri Jaswant Singhji had two sons named Shardul Singh and Daulat Singh, and a daughter named Bhagwat Kanwar. His wife was Gajendra Kanwar. She had further stated that Daulat Singh was taken in adoption by Thakur Madan Singhji, brother of Jaswant Singhji. The said Jaswant Singhji died in the year 1966 and at that time, she had three sons- Digvijay Singh, Rajendra Singh and Ravi Pratap Singh. The other witnesses examined by the appellants-plaintiffs, who were Kamdars working in the Haveli had also supported the case of the plaintiffs and further stated that the subject property was given by way of 'Bakhshish' to the Thakur Shri Mansingh and the Haveli known as "Padli House" was an ancestral property in the hands of Jaswant Singh. 24. So far as the oral evidence led by the respondents is concerned, the respondent No. 1 Sant Ram was examined as DW 2, respondent No.2 Amar Lal, as the partner of the firm Rajaram Amar Lal was examined as DW 1 and the respondent No.3 Shivnarain was examined as DW 3. According to their respective versions, late Shri Jaswant Singh was the Jagirdar of Thikana Padli and the Jagirs were resumed in the year 1958 on the enactment of Resumption of Jagirs Act passed by the State of Rajasthan. They have stated in their respective evidence interalia that before the said Jaswant Singh expired in the year 1967-68, he had executed one gift deed in the year 1960 in favour of his son Shardul Singh, who had in turn executed the respective sale deeds in question in favour of the said respondents as the said Shardul Singh needed money to fight the legal proceedings and as he had to discharge the antecedents debts. It is pertinent to note that DW 1 Amar Lal in his cross-examination had admitted that the Haveli was an ancestral property. The DW 2 Sant Ram had also admitted in his cross-examination that late Shri Jaswant Singh had told him that the property 'Padli House was given by the State by way of 'Bakhshish'. He had also admitted that late Shri Jaswant Singh had received the compensation on the resumption of Jagir properties. 25. From the said oral evidence led by the parties, it clearly transpires that it was not disputed by the parties that the subject Haveli known as "Padli House" was given by the State by way of 'Bakhshish' or "Grant" to late Shri Thakur Mansinghji, as per the document Ex.1 and that Shri Jaswant Singh was the last holder by succession of the said property. It was also not disputed by the respondents-defendants that the said property was not the self acquired property of late Shri Jaswant Singh. It is also not disputed that the said Jaswant Singh had two sons named Shardul Singh and Daulat Singh, one daughter Bhagwat Kanwar, and wife Gajendra Kanwar, and that his son Daulat Singh was already taken in adoption by his brother Thakur Madan Singh. It is also not disputed that when Shri Jaswant Singhji expired in 1966 his son Shardul Singh i.e. respondent No.7 had three minor sons i.e. the appellant Nos. 1 to 3. Now, when the subject property was not the self acquired property of Shri Jaswant Singhji and was inherited by him from his forefathers, the question is-could he have treated the said property as his personal or separate property and executed the gift deed in favour of his son Shardul Singhji in the year 1960 as alleged by the respondents. It is pertinent to note that though the original gift deed dated 13.9.60 is not on record, the copy thereof was produced by the respondents, which was exhibited as Ex. A/1. "18. It is a trite proposition that property though impartible may be the ancestral property of the joint Hindu family. The impartibility of property does not per se destroy its nature as joint family property or render it the separate property of the last holder, so as to destroy the right of survivorship; hence the estate retains its character of joint family property and devolves by the general law upon that person who being in fact and in law joint in respect of the estate is also the senior member in the senior line. "Where a custom is proved to exist, it supersedes the general" law, which, however, still regulates all beyond the custom"
"Impartibility is essentially a creature of custom. In the case of ordinary joint family property, the members of the family have (1) the right of partition, (2) the right to restrain alienations by the head if the family except for necessity, (3) the right of maintenance and (4) the right of survivorship. The first of these rights cannot exist in the case of an impartible estate, though ancestral, from the very nature of the estate. The second is incompatible with the custom of impartibility as laid down in Sartaj Kuari's(1) case and the first Pittapur case; (2) and so also the third as held in the second Pittapur case. (3) To this extent the general law of the Mitakshara has been superseded by custom, and the impartible estate though ancestral is clothed with the incidents with the incidents of self-acquired and separate property. But the right of survivorship is not inconsistent with the custom of impartibility. This right, therefore, still remains, and this is what was held in Baijnath's case. To this extent the estate still retains its character of joint family property, and its devolution is governed by the general Mitakshara law applicable to such property. Though the other rights which a co-parcener acquires by birth in joint family property no longer exist, the birth-right of the senior member to take by survivor ship still remains. Nor is this right a mere spes succession is similar to that of a reversionary succeeding on the death of a Hindu widow to her husband's estate. It is right which is capable of being renounced and surrendered. Such being their Lordships' view, it follows that in order to establish that a family governed by the Mitakshara in which there is an ancestral impartible estate has ceased to be joint, it is necessary to prove an intention, express or implied, on the part of the junior members of the family to renounce their right of succession to the estate." Since the decision of the Privy Council in Shiba Prasad Singh's case (supra), it is well-settled that an estate is impartible does not make it the separate and exclusive property of the holder : where the property is ancestral and the holder has succeeded to it, it will be part of the joint estate of the undivided family. 22. In Chinnathavi's case. supra, it was observed that the dictum of the Privy Council in Shiba Prasad Singh case, supra, that to establish that an impartible estate has ceased to be joint family property for purposes of succession, it is necessary to prove an intention, express or implied, on the part of the junior members of the family to give up their chance of succeeding to the estate. The test to be applied is whether the facts show a clear intention to renounce or surrender any interest in the impartible estate or a relinquishment of the right of succession and an intention to impress upon the zamindari the character of separate property." 23. In the instant case, admittedly, the subject property "Padli House" was inherited by Shri Jaswant Singhji from his forefathers and was not his self acquired property. Even if it is believed that he held the said property by rule of primogeniture and hence it was impartible, though there is no cogent evidence on record, then also the impartibility character of the property did not per se destroy its nature as joint family property or render it the separate property of the last holder. There is also nothing on record to suggest that the said impartible estate had ceased to be joint family property for the purposes of succession. As held by the Apex Court in the case of Nagesh Bisto (supra), in order to prove that the impartible estate had ceased to be joint family property, it was necessary to prove the clear intention on the part of the junior members of the family to give up their chance of succeeding to the estate or to renounce or surrender any interest in the impartible estate. In the instant case, there is no evidence whatsoever to show that the appellants Nos. 1 to 4 who were the junior members of the family had renounced or surrendered their part of interest in the subject property. "The very fact that the Jagir was an ancestral property and the Jagirdar was holding the Jagir as property of the Hindu undivided family, with a rider that the members of the family could not get a partition effected because of the fact that by custom the Jagir property was impartible in nature and was governed by the rule of primogeniture. However, since the Jagir was resumed, the impartible character of the property was lost and the joint family property became subject to partition. So the co-sharers could exercise other rights as coparceners in the joint family property. The khudkasht land held by the Jagirdar must, therefore, be held by him on behalf of and for the benefit of the joint Hindu family, of which he was the karta and although the ex-jagirdar became the khatedar tenant in respect of such Khudkasht land, yet the Khatedari rights were held by him on behalf of the joint Hindu family of which he was the Karta." 25. Thus, it is clear from the aforesaid legal position that an estate which was impartible by customs could not be said to be separate or exclusive property of the holder of the estate, if the holder had got the estate as an ancestral estate and had succeeded to it by primogeniture. There has to be established clear intention on the part of the junior members of the family to renounce or surrender their chance of succeeding to such estate. In absence of such evidence, such property would be part of joint estate of the undivided Hindu family. The court therefore has no hesitation in holding that the property known as "Padli House" and the suit properties which were part of the said property were not the personal or separate property of late Shri Jaswant Singhji but was the properties of the joint Hindu Family, of which the respondent No.7 and his sons were the coparceners. "A father cannot turn joint family property into absolute property of his son by merely making a Will, thus depriving sons of the son who might be born thereafter of their right in the joint family property. It is well settled that the share which a co-sharer obtains on partition of ancestral property is ancestral property as regards his male issues. They take an interest in it by birth whether they are in existence at the time of partition or are born subsequently." "Further it was equally well settled that under the Mitakshara Law each son upon his birth takes an interest equal to that of his father in ancestral property, whether it be movable or immovable. It is very important to note that the right which the son takes at his birth in the ancestral property is wholly independent of his father. He does not claim through the father." 28. It is needless to say that the essence of a coparcenary under the Mitakshara School of Hindu law is community of interest and unity of possession .A member of joint Hindu family has no definite share in the coparcenary property, but has an undivided interest in the property which is liable to be enlarged by deaths and diminished by births in the family. Therefore, one coparcener would not have any right to dispose of either by gift or otherwise, even his undivided share in the coparcenary property without the consent of the other coparceners. It has been held in catena of decisions by the Supreme Court that a gift by a coparcener of his undivided interest in the coparcenary property is void. Beneficial reference of the judgments of Apex Court in case of T. Venkata Subbamma v. T. Rathamma, AIR 1987 SC 1775, and in case of Baljinder Singh v. Rattan Singh, (2008) 16 SCC 785 be made in this regard. Thus, in view of this settled legal position, late Shri Jaswant Singhji could not have executed the gift deed in favour of his son Shardul Singh in respect of the suit properties, which were the coparcenary properties, depriving the appellants of their right in the said properties and that if such a gift deed as alleged by the respondents was executed by Shri Jaswant Singhji in the year 1960, it was to be treated as a void document. 29. It is pertinent to note that the original gift deed dated 13.9.60 allegedly executed by Shri Jaswant Singhji in favour of his son Shardul Singhji was not placed on record by the concerned respondents nor the respondent No.7 Shardul Singhji was called upon to produce the same. What has been produced at Ex.A/1 is the copy of the gift deed dated 13.9.60. As a matter of fact, the said document having not been duly proved in accordance with Section 68 of the Evidence Act, should not have been admitted in evidence by the trial court. In any case, since this court has held that the said Shri Jaswant Singhji could not have executed such a gift deed in favour of the respondent No.7 Shardul Singh in respect of the coparcenary properties, depriving the rights of the other coparceners in the said properties, the said gift deed even if believed to have been executed would be a void document and deserved to be ignored. The submission made by the learned counsel Mr. Kasliwal that the appellants had not challenged the said gift deed in the suit, also does not deserve consideration, in view of the settled legal position that the document which is void in the eye of law cannot have any binding force on the persons who are not the party to such a document, and therefore such document deserves to be ignored. Even otherwise, the copy of gift deed Ex. A/1 having also not been duly proved by the concerned respondents, the same could not be read in evidence. The judgment of Apex Court in case of R. Kuppayee and Anr. v. Raja Gounder (2004) 1 SCC 295, relied upon by the learned counsel Mr. Kasliwal is more helpful to the appellants than to the respondents, inasmuch as it has been specifically held in the said judgment that "the position in Hindu Law is that whereas the father has the power to gift the ancestral movables within reasonable limits, he has no such power with regard to the ancestral immovable property or coparcenary property. He can, however, make a gift within reasonable limits of ancestral immovable property for pious purposes. However, the alienation must be by an act intervivos and not by Will." In the instant case the alleged gift deed was executed by the said Jaswant Singh neither for pious purposes, nor was an act intervivos. Hence, such a gift deed, jeopardising the rights of the sons of the respondent No. 7 Shardul Singh, and other alleged alienations based on such void document of gift deed could not be made binding to the appellants. Provided that, if the deceased had left him surviving a female relative specified in Class I of the Schedule or a male relative specified in that class who claims through such female relative, the interest of the deceased in the Mitakshara coparcenary property shall devolve by testamentary or intestate succession, as the case may be, under this Act and not by survivorship. Explanation 1. For the purposes of this section, the interest of a Hindu Mitakshara coparcener shall be deemed to be the share in the property that would have been allotted to him if a partition of the property had taken place immediately before this death, irrespective of whether he was entitled to claim partition or not. Explanation 2. Nothing contained in the proviso to this section shall be construed as enabling a person who has separated himself from the coparcenary before the death of the deceased or any of his heirs to claim on intestacy a share in the interest referred to therein." 31. From the bare reading of the said provisions contained in Section 6, read with the proviso and the Explanation-1 contained in the said section, it clearly transpires that when a male Hindu dies leaving behind any female relative specified in Class I of the Schedule to the Act or male relative specified in that class claiming through such female relative, his interest in the Mitakshara coparcenary property would not devolve upon the surviving coparcenary by survivorship, but would devolve by succession as per the Act. It further transpires that the undivided interest of the deceased coparcenary can be ascertained by the deeming provision contained in the Explanation-1 of the said section, according to which the interest of Hindu Mitakshara coparcener shall be deemed to be the share in the property that would have been allotted to him, if the partition of the property had taken place immediately before his death, irrespective of whether he was entitled to claim partition or not. Thus, Section 6 pertains to the devolution of interest of the deceased male Hindu in the coparcenary property when he had left female relative specified therein and does not pertain to the devolution of the whole of coparcenary property he was holding at the time of his death. In view of Explanation-1, a notional partition had to be assumed as if it had taken place immediately before the death of the Hindu Mitakshara coparcener, and accordingly only the undivided interest of the deceased would devolve upon his heirs by succession as per the provisions of the Act of 1956, which would include surviving coparceners also, who apart from the devolution of the undivided interest of the deceased upon them by succession, would also be entitled to claim their undivided interest in the coparcenary property, which they could have got in notional partition. This position of law has been very well settled by the Apex Court in case of Gurupad Khandappa Magdum v. Hirabai Khandappa Magdum & Ors. AIR 1978 SC 1239 and in case of Anar Devi & Ors. v. Parmeshwari Devi & Ors. AIR 2006 SC 3332. 32. In the instant case, since the suit properties were the coparcenary properties when the said Thakur Jaswant Singh expired in the year 1966, and since he had left behind him the female members namely, Smt. Gajendra Kanwar and Bhagwat Kanwar, who were respectively wife and daughter falling under Class I of the Schedule to the Act of 1956, his interest in the suit properties would devolve upon his heirs by succession and not by survivorship, as per the proviso to Section of the Act of 1956. Further, as per the Explanation-1 of the said Section, the interest of the deceased Jaswant Singhji was required to be ascertained by the deeming fiction i.e. by assuming a notional partition of the properties on his death, and his interest would be deemed to be share in the said properties as if a partition had taken place immediately before his death. There is nothing in the said Section 6 to suggest that if the deceased had left behind him surviving female relatives specified in Class-I of the Schedule, the entire Section 6 would not be applicable, as sought to be submitted by the learned counsel Mr. Kasliwal. Section 8 of the Act of 1956 pertains to the general rules of succession in case when a Hindu male dies intestate. The said provision could be made applicable to the property of a male Hindu who dies intestate, which is personal or self acquired property of the male Hindu or to the extent of his interest in the coparcenary property. When there is specific provision made under Section 6 with regard to devolution of the interest in coparcenary property of a male Hindu, there is no question of making applicable Section 8 to the whole of coparcenary property of a male Hindu. 33. It may be true that when son inherits the property in the situation contemplated by Section 8, he does not take it as Karta of his own undivided family but takes it in his individual capacity, as held by the Apex Court in case of Commissioner of Wealth Tax, Kanpur & Ors. v. Chander Sen & Ors. (1986) 3 SCC, 567, relied upon by the learned counsel Mr. Kasliwal. The case however would not have application to the facts of the present case. In the said case, partial partition of joint family property had already taken place during the life time of the father, whereas in the instant case, no partition of the coparcenary properties had taken place during the life time of Shri Jaswant Singhji, and hence the question of respondent No.7 Shardul Singhji inheriting the interest of Jaswant Singhji in the said properties, so as to make applicable Section 8, did not arise. There also cannot be any disagreement to the proposition of law laid down by the Apex Court in case of Thimmaiah & Ors. v. Ningamma & Anr. (supra) relied upon by the learned counsel Mr. Kasliwal, however the same is not applicable to the facts of the present case, inasmuch as in the said judgment the question was whether Section 4 of the Act of 1956 had overriding effect over the law i.e. Karnataka Hindu Law Women's Rights Act, 1933 and the court held that the said Act to the extent it was inconsistent with the provisions of the Hindu Succession Act would be superseded by the proviso to Section 6 of the Act of 1956. As such, the ratio of the judgment contained in the case of Gurupad Khandappa Magdum v. Hirabai Khandappa Magdum & Ors. (supra) has been relied upon in the said judgment. In that view of the matter, it could not be held that Section 8 and not Section 6 of the Act of 1956 would be applicable to the facts of the present case on the death of Shri Jaswant Singh, as sought to be contended by the learned counsel Mr. Kasliwal. The court, therefore, comes to an irresistible conclusion that when Shri Jaswant Singh died in the year 1966 the suit properties being coparcenary properties had devolved upon the respondent No.7 and his sons by survivorship and that the interest of Shri Jaswant Singh in the said properties would have devolved upon his heirs by succession as per the Act of 1956, as he had surviving female relatives specified in Class-I of the Schedule to the said Act. Further, in view of Explanation 1 in Section 6, his interest in the coparcenary property would have been the share in the property that would have been allotted to him if partition had taken place immediately before his death. However, on his death there would not be disruption of the joint status of the other coparceners i.e. of the appellants and the respondent No.7. They being surviving coparcener had remained joint and would remain joint till actual partition takes place. 34. The next question that falls for consideration before the court is, whether the respondent No.7 was entitled to execute the sale deeds in question? The other related question which also requires consideration is whether such alienations were made by the respondent No.7 for the legal necessity or for the discharge of antecedent debt or for the benefit of estate, as contended by the respondents? It cannot be gainsaid that Karta or the Manager could alienate the joint family properties in four situations namely for legal necessity, for discharge of antecedent debts, for the benefit of the estate or with the consent of all the coparceners of the family. 21.In a Hindu family, the karta or manager occupies a unique position It is not as if anybody could become manager of a joint Hindu family. "As a general rule, the father of a family, if alive, and in his absence the senior member of the family, is alone entitled to manage the joint family property." The manager occupies a position superior to other members. He has greater rights and duties. He must look after the family interests. He is entitled to possession of the entire joint estate He is also entitled to manage the family properties. In other words, the actual possession and management of the joint family property must vest in him. He may consult the members of the family and if necessary take their consent to his action but he is not answerable to every one of them." "24. Although the power of disposition of joint family property has been conceded to the manager of joint Hindu family for the reasons aforesaid, the law raises no presumption as to the validity of his transactions. His acts could be questioned in the Courts of law. The other members of the family have a right to have the transaction declared void, if not justified. When an alienation is challenged as being unjustified or illegal it would be for the alienee to prove that there was legal necessity in fact or that he made proper and bonafide enquiry as to the existence of such-necessity. It would be for the alienee to prove that he did all that was reasonable to satisfy himself as to the existence of such necessity. If the alienation is found to be unjustified, then it would be declared void. Such alienations would be void except to the extent of managers share in Madras, Bombay and Central Provinces. The purchaser could get only the managers share. But in other provinces, the purchaser would not get even that much. The entire alienation would be void. [Maynes Hindu Law 11th ed. Para 396]." "I do not think that these submissions are sound. It is true that a coparcener takes by birth an interest in the ancestral property, but he is not entitled to separate possession of the coparcenary estate. His rights are not independent of the control of the karta. It would be for the karta to consider the actual pressure on the joint family estate. It would be for him to foresee the danger to be averted. And it would be for him to examine as to how best the joint family estate could be beneficially put into use to subserve the interests of the family. A coparcener cannot interfere in these acts of management. Apart from that, a father-karta in addition to the aforesaid powers of alienation has also the special power to sell or mortgage ancestral property to discharge his antecedent debt which is not tainted with immorality. If there is no such need or benefit, the purchaser takes risk and the right and interest of coparcener will remain unimpaired in the alienated property. No doubt the law confers a right on the coparcener to challenge the alienation made by karta, but that right is not inclusive of the right to obstruct alienation. Nor the right to obstruct alienation could be considered as incidental to the right to challenge the alienation. These are two distinct rights. One is the right to claim a share in the joint family estate free from unnecessary and unwanted encumbrance. The other is a right to interfere with the act of management of the joint family affairs. The coparcener cannot claim the latter right and indeed, he is not entitled for it. Therefore, he cannot move the court to grant relief by injunction restraining the karta from alienating the coparcenary property." "11. Recitals in a deed of legal necessity do not by themselves prove legal necessity. The recitals are, however, admissible in evidence, their value varying according to the circumstances in which the transaction was entered into. The recitals may be used to corroborate other evidence of the existence of the legal necessity." "In exceptional circumstances, however, the court will uphold the alienation of a part of the joint family property by a karta for the acquisition of new property as, for example, where all the adult members of the joint family with the knowledge available to them and possessing all the necessary information about the means and requirements of the family are convinced that the proposed purchase of the new property is for the benefit of the estate." 40. It may be further noted that when the alienation is made by Karta allegedly for discharging antecedent debts, it must be proved that such antecedent debt must be antecedent in fact as well as in time, that is to say that the debt must be truly independent of and not part of the transaction impeached. Beneficial reference of the decision of the Apex Court in case of Prasad & Others v. V. Govindaswami Mudaliar & Ors. (1982) 1 SCC, 185 be made in this regard. It has also been held in the said decision interalia that "the father in a joint Hindu family may sell or mortgage the joint family property, including the sons' interest therein to discharge a debt contracted by him for his own personal benefit, and such alienation would be binding to sons, provided (a) the debt was antecedent to the alienation, and (b) it was not incurred for an immoral purpose". It is also required to be proved that the father acted like a prudent man and did not sacrifice the joint family property for an inadequate consideration. 41. In the light of the aforesaid legal position, let us examine the evidence on record as to whether the respondent No.7 had made alienations in question for any legal necessity or for discharging any antecedent debt or for the benefit of estate, and whether the respondents-alienees had made proper inquiries in this regard, before entering into the transactions in question. The court will also have to examine as to whether the father i.e. the respondent No.7 had acted like a prudent man and did not sacrifice the joint family properties for an inadequate consideration. The respondent No.2 Amar Lal examined as DW 1 had stated in his evidence interalia that the reason for Shardul Singhji to sell the suit property was that he had incurred certain debts. According to him when he asked Shardul Singh about the reason, he had told him that he needed money for meeting with the litigation expenses and also the domestic expenses. In the cross-examination, he had admitted that the subject property Haveli was an ancestral property. He further admitted that he did not know whether Shrdul Singh had incurred any debt. He also admitted that he was not aware about the domestic expenses of the said Shardul Singh. He admitted that out of the sale consideration of L 25,000/-, he had paid only L 10,000/- to Shardul Singh, and he was required to pay balance amount of L 15,000/- to defendant No.3 Shivnarain which he had not paid till the date. He also admitted that on the date i.e. 7.9.70 when he purchased one part of the suit properties from Shardul Singh for L 25,000/-, another part of the said property was purchased by the partner of his firm, Shri Sant Ram for L 30,000/- on the same day. He had further stated that about 5-6 months prior to the said sale of the suit properties, Shardul Singh had mortgaged both the properties sold to them with Shivnarain. 42. The respondent No.1 Santram examined as DW 2 had stated interalia that he had purchased one part of "Padli House" from Shardul Singh for L 25,000/- and on making inquiry, about the ownership, the said Shardul Singh had shown him the gift deed executed by Jaswant Singh. He had further stated that Shardul Singh had sold out the said property as he had incurred certain debts and needed money for fighting the litigations. He admitted that out of L 25,000/- to be paid to Shardul Singh, he had paid only L 10,000/- in cash and rest of the amount of L 15,000/- was to be paid to Shivnarain for redeeming the mortgage, however, he had not paid the said amount to Shivnarain till the date. He also admitted that there were tenants in the other part of the "Padli House" property, however he did not know as to what was the rent income of Shardul Singh from the said properties. 43. The respondent No.3 Shivnarain S/o Rajaram was examined as DW 3. He had also stated interalia that the defendant No. 7 Shardul Singh had sold out the property to him for L 30,000/- by way of conditional sale as he had to repay some debt to one Daulat Singh. According to him out of the said amount, the said Shardul Singh had paid L 20,000/- to Daulat Singh for redeeming his mortgaged property and must have utilised rest of the amount of L 10,000/- for his household expenses. He had admitted in his cross-examination that there was no reference either in the sale deed Ex. A/5 or in the agreement Ex. A/3 that the amount was utilised by Shardul Singh for repaying the debt to Shri Daulat Singh, byt the reference was that he needed money for the domestic expenses. The other witnesses were examined by the concerned respondents-defendants to show that the respondent No.7 did not have any bad habits of drinking or gambling. 44. So far as the documentary evidence with regard to the alienations in question is concerned, the plaintiffs had produced the sale-deed dated 7.9.70 executed by the respondent No.7 Shardul Singh in favour of the respondent No.1 Sant Ram S/o Rajaram, at Ex.5. It was stated in the said sale-deed interalia that the respondent No.7 Shardul Singh had sold out part of the properties from "Padli House", to Shivnarain S/o Rajaram for L 29,999/- by way of conditional sale; that out of the said property mortgaged with the said Shivnarain with right to repurchase, one part thereof was sold to Amar Lal, partner of Rajaram firm for L 29,999/- on 30.7.70 by registered sale deed, however, out of the sale consideration of L 29,999/- part of the amount i.e. L 20,000/- was left with the said Amar Lal, partner of firm Rajaram to enable him to get the mortgaged property redeemed from Shivnarain. It was further stated that since he (i.e. the respondent No.7) had to manage for the remaining funds to redeem the said mortgage, he was selling one part of the said mortgaged property, as described in the sale-deed (Ex.5) to Sant Ram for L 25,000/- by way of the said sale-deed dated 7.9.70 (registered on 24.9.70). It was further stated therein that out of the sale consideration of L 25,000/-, he (respondent No.7) had already received L 10,000/- on 7.8.70 from the said purchaser Sant Ram and that remaining amount of L 15,000/- was left with Sant Ram to enable him to pay to Shivnarain for redeeming the mortgaged property. It was also stated that the purchaser i.e. Sant Ram would be entitled to recover the possession of the said part of the mortgaged property from Shivnarain by redeeming the said property. 45. From the bare reading of the said sale-deed Ex.5, it transpires that out of the total sale consideration of L 25,000/-, the respondent No.7 had acknowledged the receipt of L 10,000/-, which he had received on 7.8.70. from the said Sant Ram, and that on the date of execution of sale deed i.e. 7.9.70, he had left the remaining amount of L 15,000/- with the said Sant Ram to enable him to pay to Shivnarain for redeeming the mortgaged property, meaning thereby that on 7.9.70, when the sale deed ex.5. Was executed, the respondent No.7 Shardul Singh had not received any amount from the said Sant Ram. 46. Another sale deed was produced by the appellants-plaintiffs at Ex.6, which was also executed by the respondent NO.7 on 7.9.70 in favour of Shri Amar Lal i.e. the respondent No.2 for L 29,999/-. It was stated therein interalia that one property comprised in "Padli House" was mortgaged with Shivnarain by way of conditional sale on 16.2.70 (registered on 25.2.70) for L 29,999/-; that one part of the said mortgaged property was in possession of the firm M/s. Rajaram Amar Lal as tenant; that since the said Amar Lal, partner of the said firm was desirous to purchase the said tenanted property, and since he i.e. the respondent No.7, needed the money to get the mortgaged property released from Shivnarain, he was executing the said sale deed (Ex.6)in favour of Amar Lal (respondent No.2) for L 29,999/- in respect of the said tenanted property, as prescribed in the sale deed. It was further stated that out of the sale consideration of L 29,999/-, he had received L 10,000/- on 1.7.70 and the remaining amount of L 19,999/- would be received by him from Amar Lal, when the said sale deed would be registered. The said sale deed was registered on 24.9.70 and it was stated that he had received the balance amount of L 19,999/- from the said Amar Lal. 47. From the bare reading of the said sale-deed Ex.6 also it transpires that out of the sale consideration of L 29,999/-, he had acknowledged the receipt of L 10,000/-, which he had received from Amar Lal on 1.9.70 and had received balance consideration of L 19,999/- on 24.9.70, when the said sale deed was registered, meaning thereby that on 7.9.70 when the said sale-deed Ex.6 was executed, the respondent No.7 did not receive any payment from the respondent No.2 Amar Lal. 48. The conditional sale deed dated 16.2.70 executed by the respondent No.7 in favour of the defendant No.3 Shivnarain S/o Rajaram (now deceased) for L 29,999/-, was produced by the said defendant No.3 as Ex. A/5. It was stated therein that the property mentioned therein was being mortgaged with Shivnarain with the condition to repurchase after one year and before the expiry of two years, as Shardul Singh i.e. respondent No.7 wanted to purchase another immovable property and he had to meet with the household expenses. It was further stated that out of the sale consideration, L 5,000/- was received by the respondent No.7 from Shivnarain on 14.2.70 and the remaining amount of L 24,999/- was to be received at the time of registration. The said document i.e. conditional sale deed appears to have been registered on the same i.e. on 16.2.70 and it was endorsed that the respondent No.7 had received the remaining amount of L 24,999/- in presence of the Sub Registrar. The said document is required to be read alongwith the agreement in the form of affidavit dated 14.2.70 at Ex. A/3, produced by the respondent No.3 (defendant No.3). It was stated in the said document interalia that there were many buildings, open lands and shops situated in the property called "Padli House", out of which garages and the open land as mentioned in the said document were in possession of different tenants; that one factory situated in the said property was belonging to the firm M/s. Rajaram Amar Lal who was paying rent at L 130/- per month; that since first party (the respondent NO.7) wanted to purchase an immovable property and also needed the money for meeting with the domestic expenses, he had agreed by way of the said affidavit to sell the said factory to second party, (i.e. Shivnarain S/o Rajaram) for L 29,999/-, with the condition that the respondent No.7 would have right to repurchase the said property after one year and before the expiry of two years thereof on the repayment of the entire sale consideration. In the said agreement in the form of affidavit, the respondent No.7 had acknowledged the receipt of L 5,000/- paid by the said Shivnarain i.e. respondent No.3 herein. The said respondent No.3 had also produced one another sale deed at Ex. A/4, which was executed between the respondent No.7 Shardul Singh and one Daulat Singh S/o Amar Singh on 16.9.69 (registered on 16.2.70). It was stated interalia in the said document Ex. A/4, that the property as mentioned in the said document was earlier mortgaged by the respondent No.7 with the said Daulat Singh, with a right to repurchase it within five years, for L 20,000/-, by executing one sale deed on 8.7.69; and that now the said Shardul Singh had repaid L 20,000/- and he was repurchasing the said property as per the earlier agreement. The said document appears to have been executed on 16.9.69 and was registered on 16.2.70. From the close reading of the said document it appears that in the body of the said document, the said seller Daulat Singh had stated that he had received L 20,000/- on that day i.e. on 16.9.69 from Shardul Singh and at the end of the said document an endorsement was made on 16.2.70 that the amount of L 20,000/-was received by Daulat Singh on that day in presence of the Sub Registrar. Now the said documents i.e. Ex. A/3, Ex. A/4 and Ex. A/5 produced by the respondent No.3 (defendant No.3) Shivnarain during his evidence before the trial court are read in the light of his deposition before the court, there appears to be major contradictions between his oral testimony and the documents produced by him. Though it was stated in the document of conditional sale deed dated 16.2.70 (Ex. A/5) that the property mentioned therein was mortgaged by way of conditional sale with the respondent No. 3 Shivnarain for L 29,999/-, as the respondent No.7 wanted to purchase an immovable property, in his deposition before the court, the said Shivnarain had stated that the respondent No.7 Shardul Singh had sold out the property to him for L 30,000/- as he (respondent No.7) had to repay some debt to one Daulat Singh. He had admitted in his cross-examination that there was no reference either in the sale-deed Ex.A/5 or in the agreement Ex.A/3 that the amount received by Shardul Singh was utilised for repaying the debt to the said Daulat Singh. Again in the sale-deed dated 16.9.69 (Ex.A/4) executed by Daulat Singh in favour of Shardul Singh, he had acknowledged the payment of L 20,000/- on 16.9.69 as stated in the body of the said document and again stated to have received the said L 20,000/- on 16.2.70at the time of registration. If the amount of L 20,000/- was already received by Shri Daulat Singh on 16.9.69 and the sale consideration was also for L 20,000/- as mentioned in the said document, there was no need for the respondent No.7 to again make payment of the said amount of L 20,000/- to the said Daulat Singh on 16.2.70. This contradiction appearing in the oral evidence of the defendant No.3 and in the documentary evidence produced by him has remained unexplained. 49. On the close scrutiny of the evidence adduced by the concerned respondents-defendants, the picture that emerges is that there was no evidence whatsoever produced by the concerned respondents to prove that the respondent No.7 Shardul Singh had executed the sale deeds or conditional sale deeds to discharge his antecedent debts. There is nothing on record to suggest that there was any past debt existing on the date when the transactions in question were entered into by the respondent No.7. As stated hereinabove, it was the duty of the respondents-alienees to enquire as to whether there was in fact any antecedent debt existing or not, or there was any legal necessity or not, which had required the respondent No.7 to make the alienations in question. There is also no evidence whatsoever produced by the said respondents to show that there was any legal necessity existing on the date of the said transactions, which had compelled the respondent No.7 to sell the suit properties. What the concerned respondents-defendants had stated in their respective evidence was that Shardul Singh needed money to meet with his domestic expenses and litigation expenses. None of them had any knowledge, as admitted by them in their cross-examination, about the existence of any antecedent debt or about the domestic expenditure of the respondent No.7. In none of the documents produced by the parties also there is any reference of such antecedent debt or legal necessity. Even otherwise, as per the settled legal position, mere recitals in the deeds of legal necessity do not by themselves prove the legal necessity. Such recitals, if any, made in the deeds would be admissible in evidence, nonetheless such recitals could be used only to corroborate the other evidence of the existence of legal necessity. Thus in absence of any proof regarding the existence of the antecedent debts or legal necessity, the alienations in questions made by the respondent No.7 in respect of the suit properties, which were coparcenary properties, having undivided shares of the appellants as coparceners, could not be held as valid alienations and deserves to be declared as void. 50. Though it was stated by the respondents that one of the suit properties was sold out by the respondent No.7 to the respondent No.3 as per the sale deed Ex. A/5 and the agreement Ex. A/3 to purchase the immovable property, there is nothing on record to show that the respondent No.7 had purchased any immovable property from the sale consideration received by him from the respondent No.3 (defendant No.3). From the document Ex. A/4, it appears that one property was repurchased by the respondent No.7 from one Daulat Singh on 16.9.69, registered on 16.2.70, however, there is nothing on record to show that the said property was repurchased by the respondent No.7 from the amount of sale consideration received by him from the respondent No.3 Shivnarain. Even otherwise, purchase of immovable property could not be construed as legal necessity by any stretch of imagination. As held by the Apex Court in case of Balmukund v. Kamla Wati (Supra), in exceptional case, the court will uphold the alienations of a part of a joint family by a Karta, for the acquisition of new property. 51. In the instant case, having regard to the evidence on record it clearly transpires that the concerned respondents-defendants had failed to prove that the sale deeds in question executed by the respondent No. 7 in respect of the suit properties which were coparcenary properties, were executed for legal necessity or for discharging any antecedent debts. It has also not been proved that the said sales were effected by the respondent No.7 for purchase of immovable property or for the benefit of the estate. On the contrary as transpiring from the transactions in question and from the evidence of the respondents themselves, it has come on record that the respondent No.7 had even not received the full sale considerations from the said respondents in respect of the said sales and that the respondent No.7 had acted in a very imprudent manner. In view of the aforegoing discussion and the findings, the court comes to an irresistible conclusion that the sales/alienations in question made by the respondent No.7 in favour of the other respondents were neither for legal necessity nor for antecedent debts nor for the benefit of the estate and therefore, such alienations being totally unjustified are required to be declared invalid and not binding to the appellants. "5. With regard to the undivided interest of the Hindu minor in joint family property, the provisions afore-culled are beads of the same string and need be viewed in a single glimpse, simultaneously in conjunction with each other. Each provisions, and in particular Section 8, cannot be viewed in isolation. If read together the intent of the legislative in this beneficial legislation becomes manifest. Ordinarily the law does not envisage a natural guardian of the undivided interest of a Hindu minor in joint family property. The natural guardian of the property of a Hindu minor, other than the undivided interest in joint family property, is alone contemplated under Section 8, whereunder his powers and duties are defined. Section 12 carves out an exception to the rule that should there be no adult member of the joint family in management of the joint family property, in which the minor has an undivided interest, a guardian may be appointed; but ordinarily no guardian shall be appointed for such undivided interest of the minor. The adult member of the family in the management of the Joint Hindu Family property may be a male or a female, not necessarily the Karta. The power of the High Court otherwise to appoint a guardian, in situations justifying, has been preserved. This is the legislative scheme on the subject. Under Section 8 a natural guardian of the property of the Hindu minor, before he disposes of any immovable property of the minor, must seek permission of the court. But since there need be no natural guardian for the minors undivided interest in the joint family property, as provided under sections 6 to 12 of the Act, the previous permission of the Court under Section 8 of disposing of the undivided interest of the minor in the joint family property is not required. The joint Hindu family by itself is a legal entity capable of acting through its Karta and other adult members of the family in management of the joint Hindu family property. Thus section 8 in view of the express terms of Sections 6 and 12, would not be applicable where a joint Hindu family property is sold/disposed of by the Karta involving an undivided interest of the minor in the said joint Hindu family property." 53. It was sought to be submitted by the learned counsel Mr. Kasliwal for the respondent Nos. 1 and 2, relying on the documents produced by him alongwith the application under Order 41, Rule 27 of the CPC, that during the pendency of the appeal, one decree was passed by the learned Addl. District Judge No.3, Jaipur City, Jaipur on 17.8.02, in the suit filed by the respondent No.1 Sant Ram and the respondent No.2, against the respondent No.3 Shivnarain, pursuant to which the legal representatives of the respondent No.3 Shivnarain had executed a deed of redemption in favour of the respondent Nos. 1 and 2 on 12.8.02 and, therefore, the said respondent Nos. 1 and 2 had become the owners of the said property, which was also part of the suit properties. He also submitted that the respondent No.7 had also executed two other sale deeds on 14.7.03 in favour of one Fateh Chand Sharma and Smt. Krishna Devi respectively for selling the properties adjoining to the subject properties, and that in the said sale-deeds, the appellant Nos. 1 to 4 had also put their respective signatures as the witnesses, which clearly suggested that the appellants and the respondent No. 7 were in collusion with each other. The court does not find any substance in the said submissions also. So far as the decree dated 17.8.02 passed in the suit being No. 33/73 filed by the said Sant Ram and the firm Rajaram against Shri Shivnarain and the present appellants and the respondent No.7 is concerned, the said decree appears to have been passed in view of the compromise entered into by the plaintiffs in the said suit i.e. Sant Ram and the firm Rajaram with the legal representatives of the deceased defendant Shivnarain, though the said compromise was objected to by the present appellants, who were the defendant Nos. 2 to 6 in the said suit. The said court while passing the said decree had specifically observed that the said compromise was subject to the result of the present appeal and that the same would be binding to the parties to the compromise only and not to the other defendants. Thus, the said decree was passed subject to the result of this appeal. With regard to the subsequent sale deeds allegedly executed by the respondent No.7 in favour of the third parties and allegedly signed by the present appellant Nos. 1 to 4 as witnesses, it may be sated that even if the said sale deeds are held to have been executed, the same would not have any bearing in the facts of the present case, inasmuch as with the consent of the other coparceners i.e. the appellant Nos. 1 to 4, who have become major now, the respondent No.7 was entitled to make alienations of the joint family properties. 54. In view of the above, the court has no hesitation in holding that the alienations in question made by the respondent No. 7 having been made without any legal necessity or for discharge of antecedent debt or for the benefit of the estate, were not valid alienations and therefore not binding to the appellants. At this juncture, it may be stated that though the appellants-plaintiffs had challenged five alienations made by the respondent No.7 (defendant No.7) in favour of the other respondents (defendants) as described in para 4(ka) to 4(Da), the appellants-plaintiffs had proved only three alienations made in favour of the respondent Nos. 1,2 and 3 described in para 4(Ka), 4(Kh) and 4(Ga), which are on record as Ex.5, Ex.6 and Ex. A/5 respectively, and that the other alienations allegedly made in favour of the respondent Nos. 4,5, and 6 as described in para 4(Gha) and 4 (Da) have not been proved. Further, the respondent No.3 Shivnarain having expired during the pendency of appeal and the appeal having abated against him, no relief could be granted to the appellants against the respondent Nos. 3 to 6. Under the circumstances, it is held that only the alienations made by the respondent Nos. 7 in favour of the respondent Nos. 1 and 2 as per Ex. 5 and 6 are declared invalid and not binding to the appellants, and are set aside accordingly. 55. So far as the shares of the appellants and the respondent No.7 in the subject properties are concerned, it is held that the properties described in para No.1 and 3, as also para 4(Ka) and 4 (Kha) of the plaint, being coparcenary properties, each of them would have equal shares i.e. ⅙th each, and that the appellants-plaintiffs would be entitled to recover the possession of their collective shares to the extent of ⅚ out of the said properties from the concerned respondents as prayed for in the suit. 56. The appellants-plaintiffs had also prayed for the permanent injunction against the respondent No.7 from transferring or alienating the properties in question, however, the said prayer cannot be granted in view of the legal position settled by the Apex Court in case of Sunil Kumar v. Ram Prakash (supra), to the effect that though the coparceners have right to challenge the alienations made by the Karta, they have no right to obstruct the alienations and, therefore, the courts cannot grant relief of permanent injunction by restraining the Karta from alienating the coparcenary properties. Hence the prayer of permanent injunction prayed for by the appellants in the suit is hereby rejected. 57. To recapitulate, it is concluded that the subject properties were the ancestral properties in the hands of late Shri Jaswant Singhji, and that he was not entitled to dispose of the same treating the said properties as his personal properties, by executing the gift deed dated 13.9.60 in favour of the respondent No.7 Shardul Sighji. The said gift deed being null and void deserved to be ignored. It is further held that after the death of said Jaswant Singhji, the joint status of the said properties as the coparcenary properties had continued, and each of the appellants had an undivided share in the same. It is also held that the alienations made by the respondent No.7 in favour of the respondent Nos. 1 and 2 as per the Ex. 5 and 6 respectively, having been made without legal necessity or for discharging antecedent debt or for the benefit of the estate, were invalid and not binding to the appellants, and hence are set aside. It is further held that each of the appellants and the respondent No.7 would have ⅙th share in the subject properties, and that the appellants are entitled to recover possession of their shares from the concerned respondents. The other reliefs claimed in the suit are rejected. 58. In view of the above, the judgment and decree passed by the trial court is set aside. The appeal is partly allowed to the aforesaid extent. The preliminary decree be drawn accordingly.